The Charles Street Jail was closed in 1990 and acquired by neighboring Massachusetts General Hospital (MGH). The X-shaped jail building has been totally renovated and re-christened as the luxury four star Liberty Hotel. The Jail's historical facade of gray Quincy Granite has been kept and a few of the original jail cells have also been restored and are supposed to be on view in the hotel lobby area. Bars on the window have been kept to enhance the flavor of the original building; how Disneyesque of the developers. Spend a night in Jail with bars on the windows all for only $500-$1000 a night, though you might be able to get a lower price with one of their many specials. I've always thought it personally advantageous not spending time in Jail, except of course when playing the game of Monopoly. 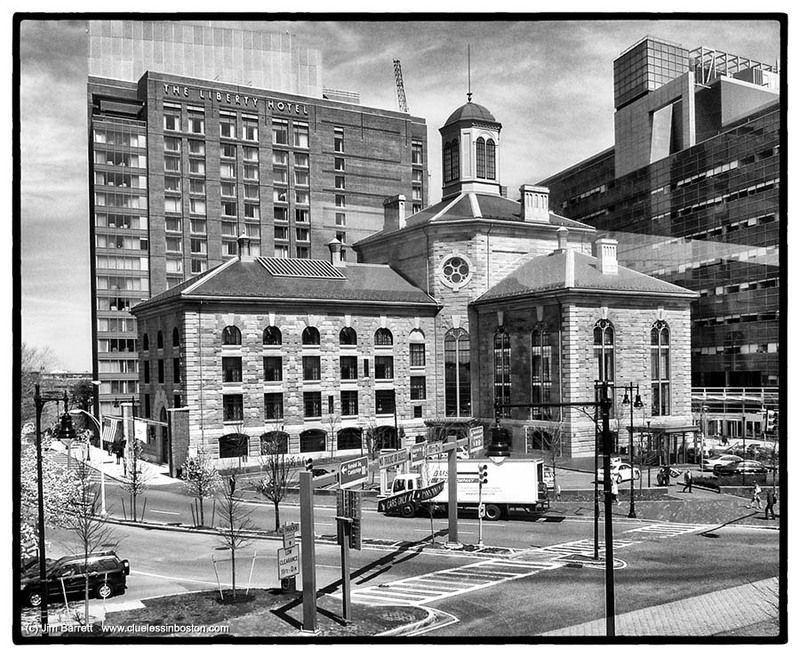 Slight reflection may be noticeable because I took the photo through glass from the Charles Street T Station. I am glad to see this. Good friends attended a wedding recently at the Liberty Hotel and told me that it is dazzling (although they also said that they were the oldest and least hip people ever to grace the hotel's lobby). I like b&w for this image, it's an impressive building! I like the irony of calling an ex gaol a 'Liberty' hotel. Oooh, I think I'd like to stay in an old hotel like that although I bet there are ghosts! Angry, bitter ghosts too! Fancy that, sleeping in a jail... This photo has an almost totally timeless quality to it! The name of the hotel must have been chosen very much with tongue in cheek!